Everything I do in life, I do for Love. Seeds, they are so little yet they mean so much. Seeds are life itself. A few reasons why I love seeds; growth that they provide, the health benefits and that they give us hope. It may seem strange to add seeds to the list of 40 things I love but let me go further into detail of why I love them so much. We need organic growth on Earth. Not only this, in my humble opinion there's nothing better than the beauty of nature. Wild flowers, green grass as far as the eye can see, trees that reach for the sun and stars. We need more of it. Seeds provide this. Nature always finds a way. Seeds are a food source that can help heal your body. If you're a woman, look into seed cycling. 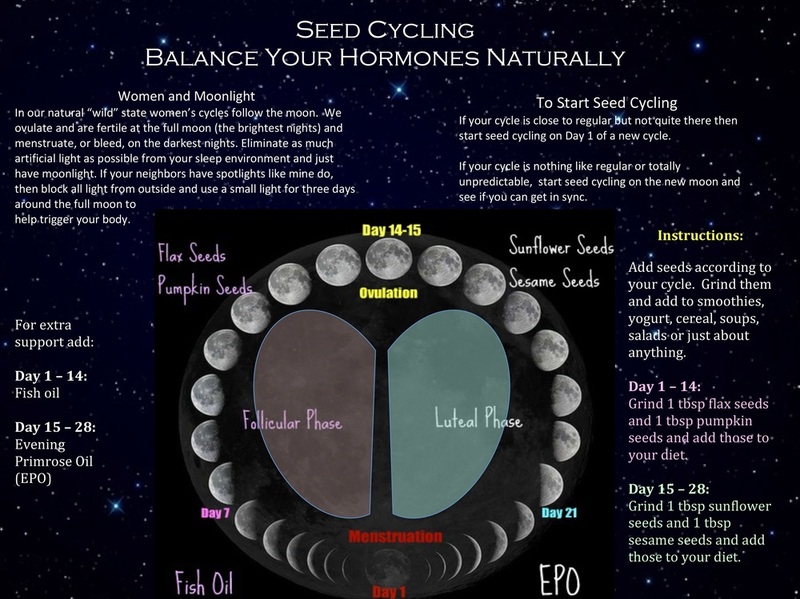 Eating different seeds at different points of the month that coordinate with the moon to help your own powerful female cycle. I love what seed cycling has done for my body, skin and soul! Research more and see what you can find. Look to the photo for a brief explanation on what to do. Other seeds that I love, chia seeds. I've written about this wonder seed a few times. The benefits are out of this world! You could survive and thrive off of these seeds. Chia seeds provide omegas, it's a complete protein, combination of fiber and protein. Chia seeds help to cleanse the body. Chia seeds have anti-aging properties. And so much more! There was a study done where two groups of hikers climbed a mountain. One group could take with them any food sources they wanted. The other group, just chia seeds. The group that had chia seeds all finished the hike, unlike the other. Bonus, most of the chia seed group finished before the members of the other group. Add them to your everyday health care. A big thank you to Chef Seth Raynor for introducing these little bad boys into my life! Maybe someday see chia shots featured on The Pearl menu? They are the caviar of the veggie world. "Have faith the size of a mustard seed". Seeds are not big by any means, yet they can grown to something larger than life. Seeds provide hope to us because something so small can make a large impact. A seed is a universe unto itself. Be that of a seed. Allow yourself to be grounded and grow. No matter how far you go, or how big you grow, you make a difference in this world. Always. If you liked this post and would like more love sent to your email box, join the LoveLetter Here. It's free! Just the way love should be.